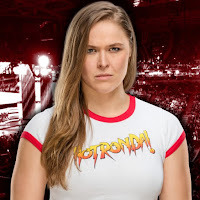 Below is video of Mike Rome talking to Ronda Rousey and RAW General Manager Kurt Angle after their win over Triple H and Stephanie McMahon at WrestleMania 34. Rousey says she's absolutely ecstatic and next to her wedding day, this was the best day of her life. Angle says Rousey was such a quick learner and not only brought her MMA and judo skills but she's also a natural at pro wrestling. Angle goes on with the in-ring debut praise and says Rousey has a big future in WWE as this is what she was meant to do.